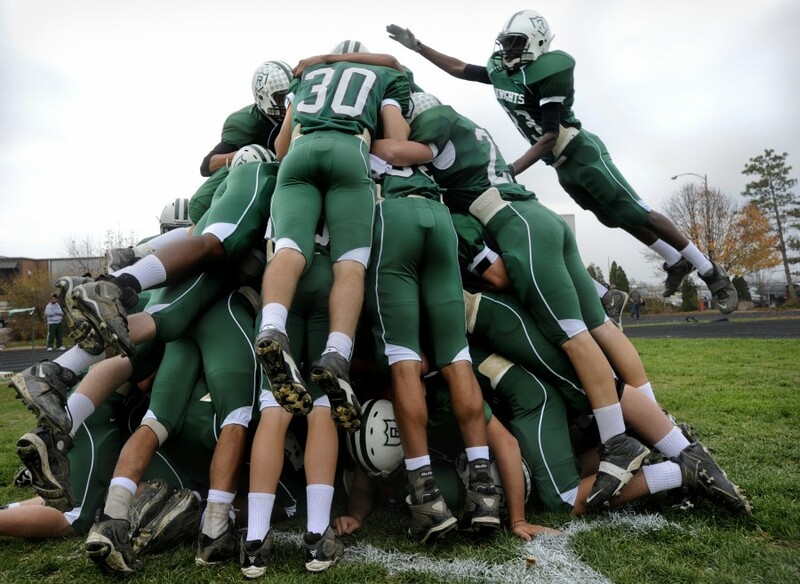 Piling on, or Holding Back? Actually, Sungenis has it exactly wrong. In fact, I withheld a great deal of other goofy and paranoid material that I could have brought to light on that page, precisely because I didn’t want to appear to be piling on. I decided instead to pick a representative sampling of his views and minimize editorializing on them, letting Sungenis’s own words speak largely for themselves. In particular, I sought to be measured in regard to the paranoid and ugly views Sungenis expressed about Jews over the past twelve years, describing in just two sentences what amounted to literally tens of thousands of words on his part. If Sungenis feels that this material puts him in a bad light and makes him look like a fool and “conspiracy nut”, then he has no one to blame but himself, because he repeatedly put up such material on his website and left it there for months and even years. Now he’s trying to memory-hole all of this by even blocking the WayBack machine (the web archive), so no one can see for himself the scope of what he wrote and posted. This latest move is particularly telling: if Sungenis doesn’t think there’s anything wrong with what he wrote, or if he is concerned that he is being quoted out of context, then why not leave the material there for others to judge for themselves? In his latest complaint, Sungenis doesn’t retract or apologize for any of his conspiracy mongering. In fact, his entire piece reads as one long self-justification. He insists that he had every right to post what he did—and how dare somebody tell him otherwise!—but he has the weird notion that if he merely pulls this material down and says that he’s not “concerned” about this panoply of alleged conspiracies any more, then everyone else has a moral obligation to stop bringing any of it up. In fact, if you don’t go along with his historical whitewashing, he’ll threaten you with a lawsuit (as he has done to me, Karl Keating, Dave Armstrong, and numerous others). This is absurd. Nobody put a gun to Sungenis’s head and forced him to engage in almost twelve years of constant, public conspiracy mongering. And now, especially in light of the fact that he refuses to apologize for or retract any of it, nobody is under any conceivable obligation to refrain from pointing out his past. Absent a forthright apology for and retraction of the many offensive and paranoid statements he has made over the years, Sungenis, like any other public figure, will simply have to run on his record. On the “Backgrounds” page of Geocentrism Debunked, I mention Sungenis’s espousal of lunar landing denial, his assertion that NASA makes crop circles from space to get “our minds off the Bible and Christ”, that 9-11 was an Israeli-inspired “inside job” most likely brought about using nuclear weapons, that likewise, Israel caused the tsunami leading to the Fukushima meltdown using nuclear weapons, that the Titanic was purposely sunk and that this is a “blueprint” for 9-11, and that dinosaurs and humans lived together and there’s a conspiracy to cover up the evidence (something he now claims is the “traditional Catholic view”). On the basis of that list Sungenis accused me of obsessively leaving “no stone unturned”. Sungenis also attempted a tu quoque by digging into my own allegedly conspiratorial past and suggesting that we have similar histories in regard to conspiracy theories. In support of this contention, he pointed out that I significantly over-estimated how severe the disruptions would be from the Y2K bug (something I already publicly acknowledged on my own web site here). He mentioned that I once wrote that I believe some of John Paul II’s words and actions caused confusion among some of the faithful (which is also true). And last, he revealed that I have stated publicly that I enjoy drinking good beer and have a now unfortunately mostly defunct blog reviewing various beers. Again, guilty as charged. Presumably, this is the strongest evidence Sungenis believes he can marshal to prove that I am no different than he is in regard to conspiracy theorizing and the conspiratorial mindset. I’m content to let the reader compare these three items with the grocery list of Sungenis’s conspiracy theories listed above and below and decide whether there is any real comparison to be made. That being said, perhaps I should also point out the obvious: I am not the one trying to convince the world to reject virtually the entire scientific community and the teaching of the Magisterium and follow me instead. Bob Sungenis is. As such, it’s perfectly reasonable to bring his other views to light so that people can consider whether or not he’s given evidence of being a trustworthy, rational, and credible person. An apt saying comes to mind: “Extraordinary claims demand extraordinary proof.” If one intends to make damning, scandalous claims in public, one bears a tremendous responsibility to exercise extreme diligence and care in firmly establishing the veracity of those claims. But if one actually takes the time to carefully examine the work of conspiracy theorists in general (which is often a particularly arduous and unpleasant task that few have the desire or time to undertake), one will almost always find that the evidence doesn’t meet the standards necessary to actually prove the case. And Sungenis’ conspiracy theories are no exception to that rule. But, nevertheless, a few people completely buy into them as gospel truth. And some others who don’t entirely believe them are still left feeling unsettled, suspicious and distrustful. It’s sad and it’s wrong, but how much more so when such conspiracies are interwoven with matters of faith? As a result of his public accusation, it seems necessary to bring the facts to light. 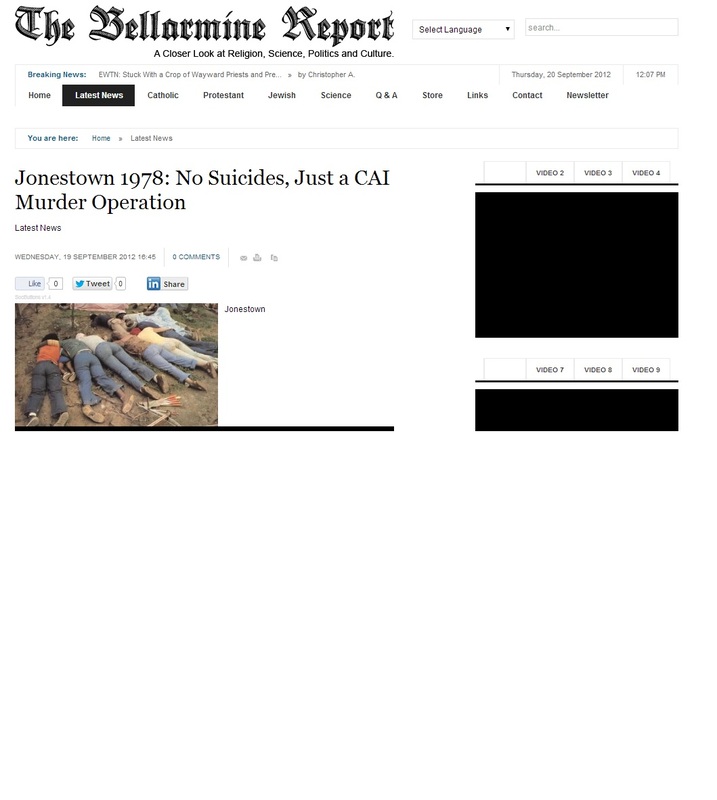 Here are some additional conspiracy theories Sungenis has promoted at his website and that I didn’t mention initially. Even the list below is not comprehensive, by a long mile. So, was I piling on or was I holding back? Judge for yourself. Sungenis publicly advanced the conspiracy theory that FDR purposely allowed the Japanese to bomb Pearl Harbor – because FDR was of Jewish extraction and wanted to help Jews gain the land of Palestine (link and link). He publicly advanced the conspiracy theory that Jews were behind the assassination of JFK because he refused to give Israel nuclear weapons. He publicly advanced as established fact that wealthy Jews behind the scenes are involved in a conspiracy to rule the world and more specifically the Catholic Church. He affirmed a questioner on his site who posited the conspiracy theory that Jews are establishing “5th columns” in all the world’s great religions. He publicly accepted without question a fraudulent “quote” from Benjamin Franklin about Jews supposedly conspiring to rule the nascent United States of America (link). He insisted that the conflict in the country of Georgia was actually caused by Jews because Georgia is a “Jewish stronghold” (even though Georgia only has a dwindling population 13,000 Jews out of a total population of about 5 million). He publicly advanced the conspiracy theory that John Paul I was murdered as an established fact (link). He has co-authored a book asserting that numerous Popes have been involved in a conspiracy to hide the truth about the Fatima secrets from the Catholic faithful (link). In his 2005 article “Vatican II’s Death Warrant on the Modern Church”, Sungenis falsely attributed a heretical, but bogus, quote to John Paul II. When he was called on this, he then claimed that the quote came from Cardinal Ratzinger. When called upon to validate that, he produced a perfectly orthodox text that did not contain the original quote at all. 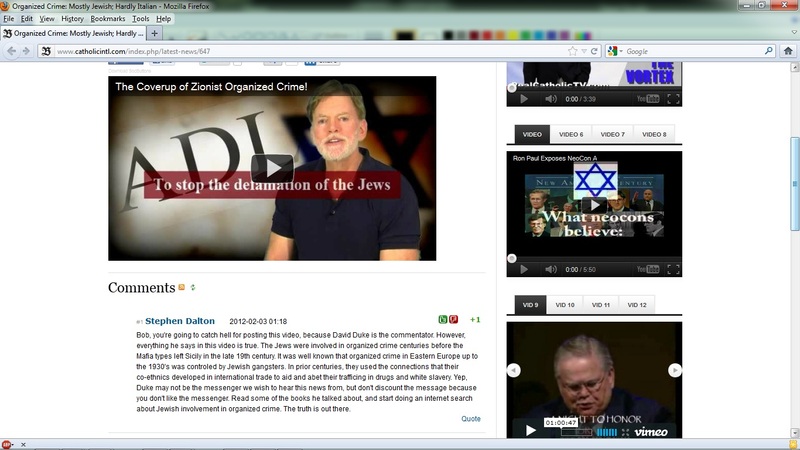 He publicly advanced the conspiracy theory that Catholic Answers and EWTN were “becoming fronts for Zionism” (link). He publicly advanced the conspiracy theory that his bishop was afraid of Jews because Jews supposedly own the mortgages on all the diocesan property. 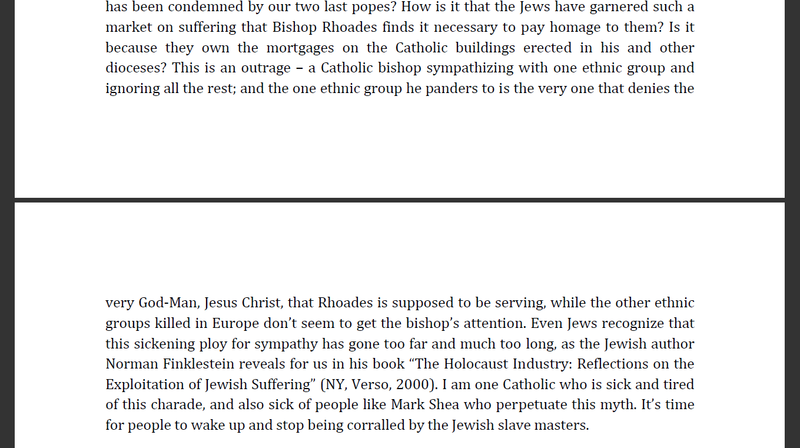 He insisted that, “It’s time for people to wake up and stop being corralled by the Jewish slave masters” (link). In his article “Politics, Religion, Israel and the Seduction of the Catholic Voter: The Neo-Con Connection”, Sungenis said of Attorney General John Ashcroft: “Attorney General John Ashcroft, a member of the Pentecostal religion who harbors a fear of calico cats because they are ‘tools of the devil,’ is also involved in promoting the Zionist eschatology.” A quick Google search on “Ashcroft calico cat” brings up a link to an article on www.snopes.com that totally debunks this urban legend. Sungenis posted a “news alert” on CAI’s home page claiming that hotel key cards retain private customer information (street address, credit card number, etc.) and can be used by rogue hotel employees for evil purposes: “An employee can take a hand full of cards home and using a scanning device, access the information onto a laptop computer and go shopping at your expense.” The information here was allegedly taken from the “Pasadena Police Department”. What Sungenis didn’t bother to find out is that the Pasadena Police Department has specifically debunked this information as a hoax. 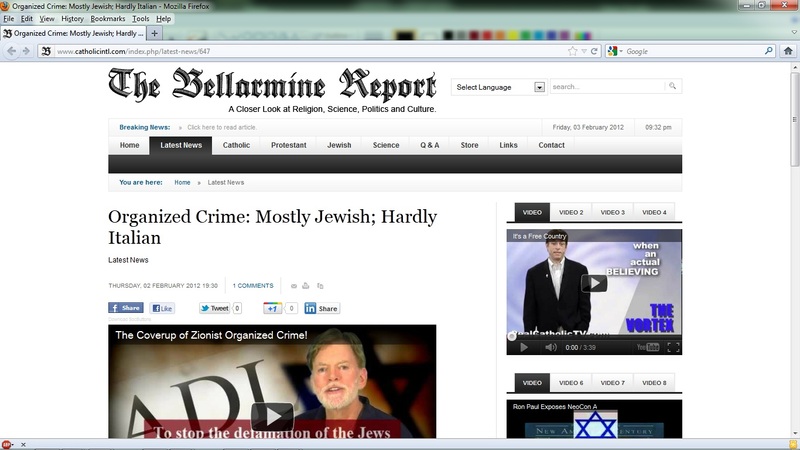 Sungenis posted a video by the notorious David Duke insisting that Jews are responsible for the bulk of organized crime (link and link). 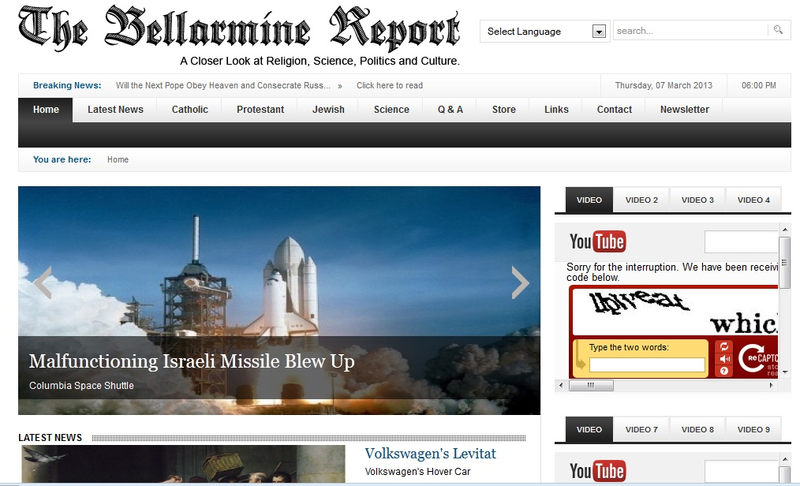 Sungenis posted an article claiming that the space shuttle Columbia was shot down by an Israeli missile (link). 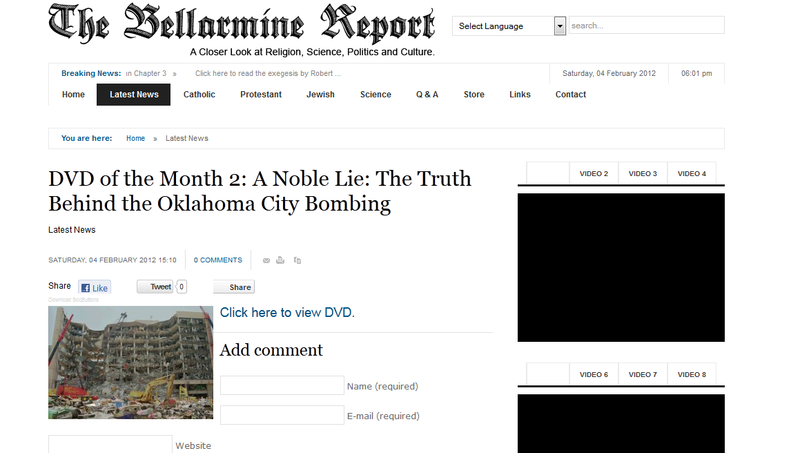 Sungenis posted an article alleging that the Oklahoma City bombing was a “false flag” operation perpetrated by the U.S. government (link). Sungenis posted an article on his cite claiming that the H1N1 virus was engineered in order to get people to take a personality-altering vaccine (link). 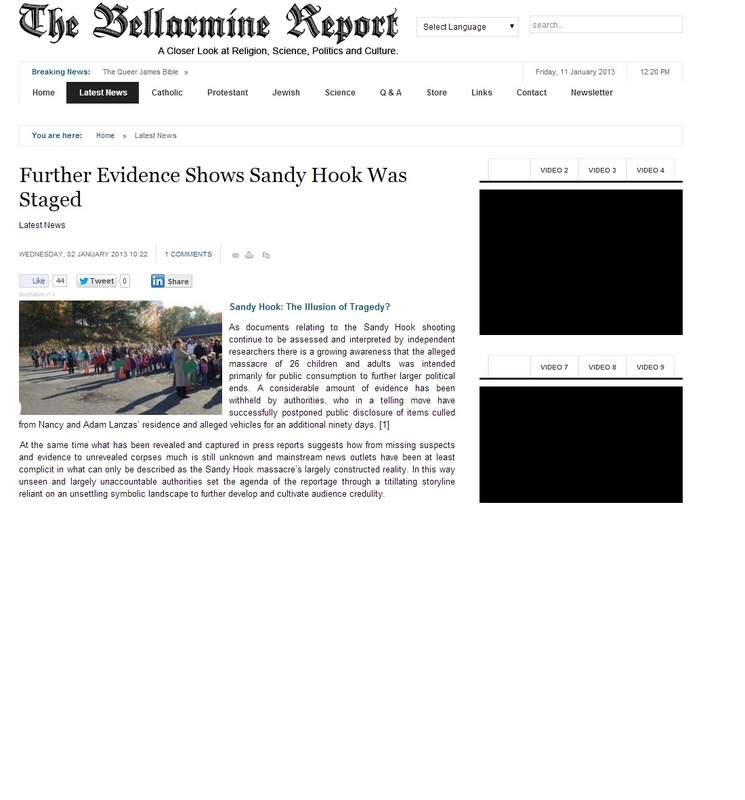 Starting just a few weeks after the Sandy Hook mass shooting, Sungenis posted several pieces insisting that it was all a hoax (link, link, and link).